Todays post is my DT project for the new challenge starting today at the Crafty Emblies Challenge Blog and the theme is Shabby Chic. and the winner of the challange get a voucher to spend on the lovely embellishments created by the owner Judie and her husband Pete. For my project I chose to alter a bisquit tin. I covered the outside of the tin with some vinage paper I got with issue 111-Christmas Cardmaking and Papercraft magazine . I decorated the top with a strip of lace and wrapped some pink gingham ribbon around the lace. I then used three different patterns of Washi Tape to create a band about a third of the way down the tube. 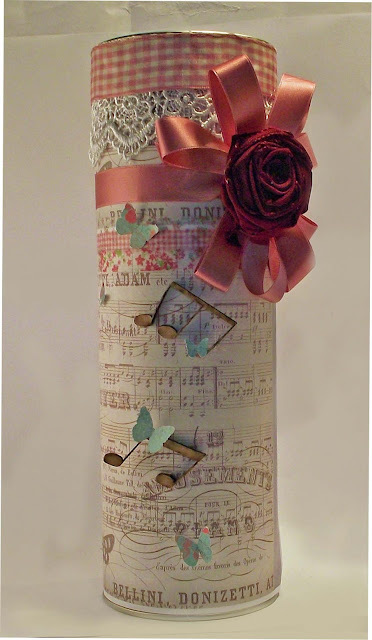 As the paper had a musical theme to it, I added some of the delicate 'notes' created by Judie at Crafty Emblies and adhered them using a hot glue pen. I made a pink star bow and adhered a red ribbon rose to the centre. This was then tied to the tinto add a little drama. To finish I added some Butterfiles punched out with a Martha Stewart punch. Take a trip over to the Crafty Emblies Challenge Blog and take a look at the lovely projects created by my very talented teamies. Don't forget to join in the challenge for a chance to win that voucher. Thank you for taking the time to stop by and read my blog. As Always your time and comments are appreciated.